Hello friends! Today, we will show you not just one but three unique cards with three different techniques. Sometimes we want cards that can be given away for any celebration or occasion. And today's cards are perfectly suitable to commemorate a birthday or an anniversary or for festivals like Diwali, Eid Mubarak or Christmas. Do you want to make these cards on your own? Scroll down to see how we made these gorgeous looking cards! 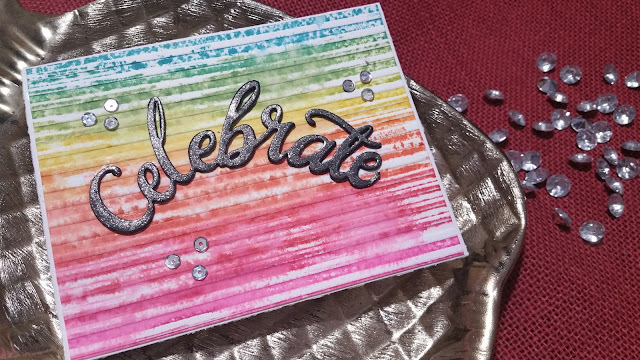 For the first card, using distress markers we applied colors in a rainbow pattern to the stripes folder and ran it through our machine for an embossed look. Then sprinkled some water to give a distress look and once it was completely dry we adhered it to an A2 size card base. Next we stacked several pieces of cardstock and foam, each cut using the 'Celebrate' word die and applied a coat of clear glitter for a shimmery chipboard accent. We adhered the chipboard to the card front, slightly curved and finally embellished the card with some silver sequins. For the second card, we started by mixing worn lipstick and fossilized amber distress oxide inks with texture paste and applied it on paper using mini flower frenzy stencil to create a textured background. Once the paste was completely dry, we covered the entire background with broken china distress oxide ink. Using the 'Celebrate' word die, we cut the center of the background and kept that piece aside for our last project. We glued the background piece on an A2 size card base. 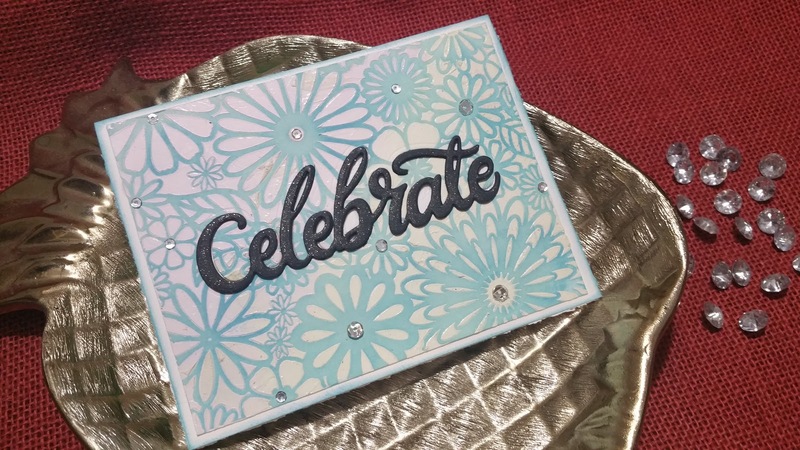 Next, we created a shimmery chipboard accent just like the card above and glued that in the opening of the word giving it a perfect dimensional look. Finally, we embellished the card by applying silver sequins at the center of some flowers. For the last card, we embossed a black piece of paper with perfectly paisley embossing folder and glued it at an angle on an A2 size card base. 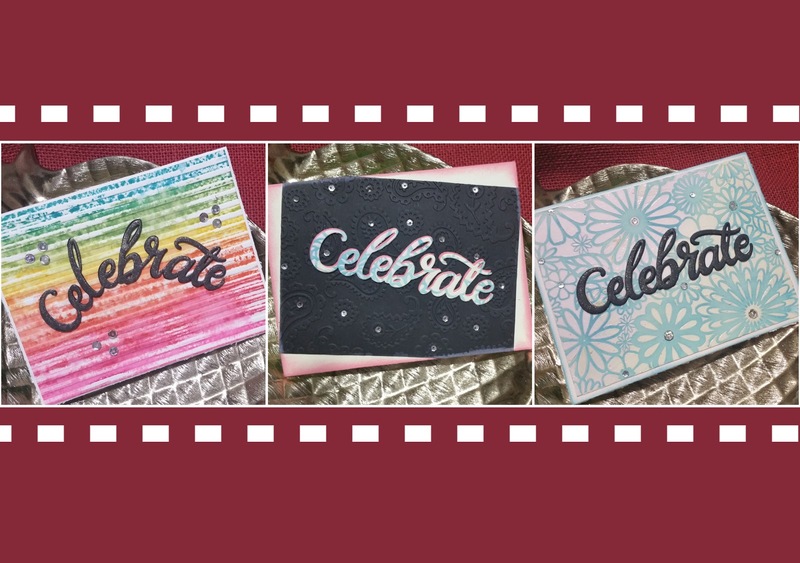 Again we glued several pieces of 'Celebrate' die cuts and sponged the top layer with worn lipstick distress oxide ink. 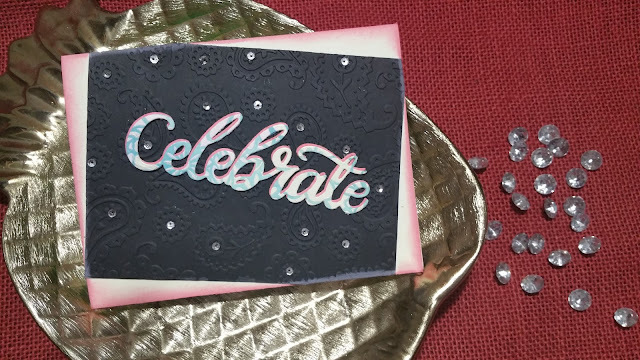 Next we created a shadow by gluing the textured 'Celebrate' die cut slightly below and to the right of the other die cuts. We adhered the sentiment at the same angle as the embossed card and adorned the card with silver sequins. For the finishing touch, we distressed the edges of the card with worn lipstick distress ink. Want to make your own cards without having to invest in all these expensive tools and materials? Our DIY kits with step by step photo instructions are the perfect solution for you. They can also be used as a craft activity to engage your guests at your next party or can be given away as a gift to someone creative in the family! 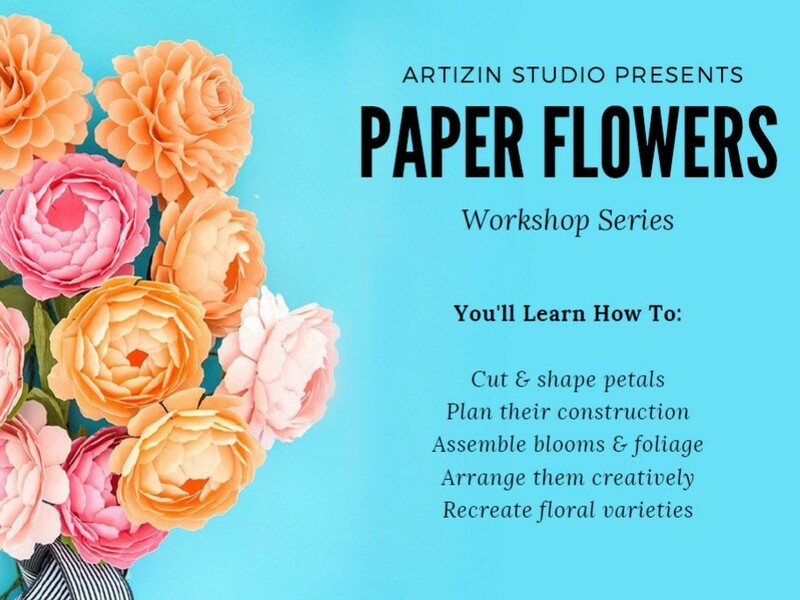 Alternatively, book your spot to visit our studio as an individual or a group and use our tools to build your own collection of cards.